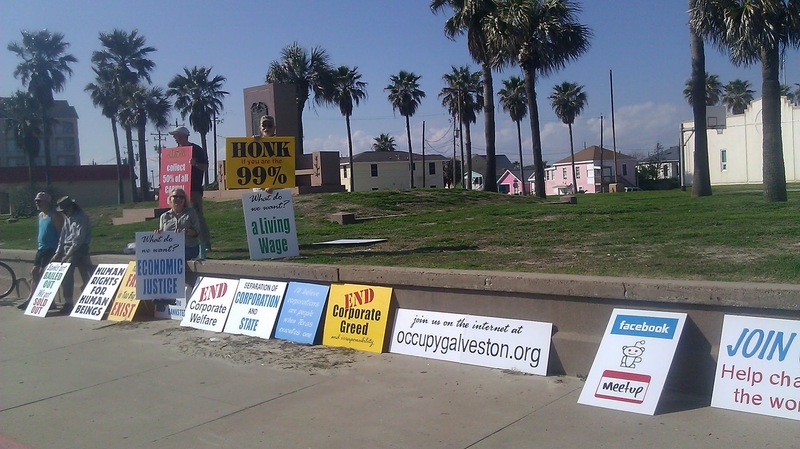 The Occupy Galveston folks were all set up on the seawall this afternoon. There were only 5 of them although I believe one may have been just a passerby. They were older than most of the Occupy people that I’ve seen on the tube around the country, and they were enjoying themselves. There isn’t any encampment and the area around them was pretty clean. I wonder if they realize that most of their complaints are pretty much the same as the TEA Partiers and libertarians, and that the fix for their issues just might be Hope and Change for November. If they change their minds perhaps all those signs could be made into a shelter or two. Yes, Galveston different and Occupy Galveston is likely different from any of the other Occupy groups.